While the early blast of summer heat has south sounders basking in the sun, unfortunately, in the past week TFD has also responded to over 20 “grass and brush” fires throughout the city. 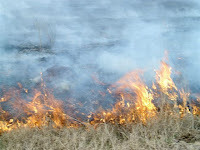 With the recent unseasonably warm weather has come dry vegetation that can fuel fires that burn and spread quickly. It is important to take into consideration some landscaping and home maintenance tips to ensure safe surroundings this summer. Trash and debris should be disposed of properly.